The Xperia mini's visually customized phonebook can store extensive information about all your contacts. The list can be sorted by either first or last name. If someone is added in more than one account, you can “join” their contact info. This can be really handy as you can have Facebook, Twitter or other service details all in the same place with the regular contact’s details. Quick contacts are enabled – a tap on the contact’s photo brings up shortcuts for calling, texting or emailing the contact. There are two contact search options – a dedicated search field on top of the contact list, and an alphabet scroll (available only when you start scrolling) to jump to names starting with a specific letter. Just as all the latest Xperia phones, the mini held on to signal well and we didn’t experience dropped calls. Reception levels are good on both ends of calls, the earpiece is loud enough and there were no interferences whatsoever. The built-in secondary microphone is used for active noise-cancellation so calls are loud and clear even in noisy environments. Unfortunately, the Xperia mini does not support smart dialing. There’s voice dialing though (the quickest way to activate it is the dedicated homescreen widget). Thanks to the proximity sensor, the Sony Ericsson Xperia mini automatically switches off its touchscreen when you hold it next to your ear during a call. As usual, the phonebook, call log and dialer are all part of the same application. The call log shows all the dialed, received and missed calls all in one list. We also ran our traditional loudspeaker test on the Sony Ericsson Xperia mini. 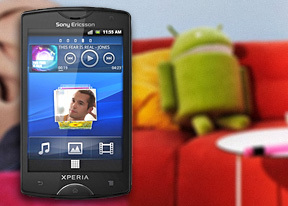 Sony Ericsson has implemented the xLOUD technology within both mini and mini pro. It enhances the loudspeaker volume without distortion of the sound. In reality the xLOUD works great for the Xperia mini making it ring much louder, while on mini pro it decreases the loudness. We have no idea why. Anyway, the mini scored a Below Average result with xLOUD turned off and an Average mark with xLOUD turned on. So we suggest keeping this setting on. More info on our loudspeaker test as well as other results can be found here. The messaging department of Android values simplicity in design and is very easy to use. All SMS/MMS communication is organized into threads. Each thread is laid out as an IM chat session, the latest message at the bottom. You can manage individual messages (forward, copy, delete) and even lock them (against deletion). You can use search to find a specific message in all conversations. The Quick Contacts feature only works in separate messages, not in the whole thread. You can also activate delivery reports. Composing a text is a little frustrating as the text box starts off as a single line and grows only to three lines, which makes working with longer texts harder. You can add multimedia (photos, videos, sounds, etc. ), which will convert the message to an MMS. Moving onto email, the Gmail app supports batch operations, which allow multiple emails to be archived, labeled or deleted. The app supports multiple Gmail accounts, but there’s no unified inbox. Sony Ericsson has added a Preview Pane to the generic email client. The preview pane can be expanded and collapsed, as well as thumb scrolled. The nice thing here is the pane stays exactly where you left it and can save you a few taps. We didn't expect the Pane to work on the 3-inch display, but it turned out as useful as on a bigger and high-res one. You can check out our video demo to see how it works. As for text input, the Xperia mini offers just the default (Gingerbread) on-screen full QWERTY keyboard (portrait and landscape) and a virtual numeric pad in portrait mode only. A tap on the text area will reveal a “handle” attached to the text cursor – it’s easy and more accurate, which makes correcting mistakes easier. A tap and hold will bring up the select options – select word and select all – with two handles to adjust the start and end of the selection. Another tap and hold brings up the copy/cut options.